ONE DAY SIMONPeter came to Jesus and asked, “Lord, how often shall I forgive my brother if he sins against me and then asks my pardon? Shall I forgive him seven times?” Perhaps Peter did not have much patience with a man who would sin against him often and always ask to be forgiven. Perhaps he thought no person could be truly sorry for his wrong-doing if he should have to ask so many times to be forgiven. How surprised Peter must have been when he heard this answer! He may have wondered whether he could ever truly forgive a man so many times as that. Then Jesus told Peter a story about a king whose servant owed him a great amount of money. Finally the king called this servant and asked him to pay the debt. But the servant had nothing with which to pay, for he had spent all the money. And because the king had a kind heart he felt sorry for the man. He told him to rise up and go away to his own house. He said, “I will forgive all the debt, and you need not try to pay it back. Then the poor man fell down at his feet and cried out, “Have patience with me, and I will pay every penny I owe.” But the king’s servant would not listen, and because the poor man had no money he threw him into the prison. 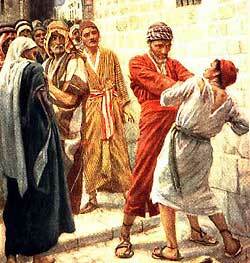 Other servants of the king were standing by and they saw how unkindly this poor man had been treated. They knew how the king had just forgiven the unkind man of a very great debt, and they felt sad because he had been unwilling to forgive the small debt of his neighbor. So they came to the king and told him how unmercifully the servant had treated his poor neighbor.